The Partagas Maduro No.1 is a rich and powerful Habano that is made using extra fermented tobacco for a more complex profile, and is a 52 by 5.1” (130mm). A La Casa Del Habano exclusive cigar limited to LCDH, it is the first maduro cigar from Partagas. 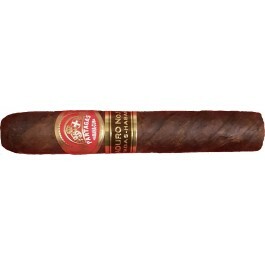 Partagas Maduro No.1 LCDH comes in a Semi Boite Nature Box of 25 cigars with Habanos packing code SBN-VW-C/L-12,13-n-25. As expected with a Maduro cigar, the wrapper color is of a nice dark brown, because of the extra fermentation of the tobacco leaf. The cigar is pretty smooth to the touch, almost silky smooth as there are few apparent veins, but it is nicely oily to make it pleasant when in hand. Its construction looks spot on, no soft spots anywhere, it is very well packed. This cigar comes with a secondary brown and golden Maduro No.1 band. The cigar emits flavors of fresh herb and of sweet chocolate. The cold draw is good, and also gives some milk chocolate flavors, with some fresh notes as well. The Partagas Maduro No.1 lights up effortlessly and burns slowly. It starts off with beautiful cocoa flavors, as well as some roasted bread notes. The cigar burns in a nice straight line. Ample chocolates notes right from the get-go, there are also hints of sweet dried apricots. The flavors are overall pretty sweet and smooth, the body is at the medium mark. Some spiciness (black pepper) creeps ups as well as some dark espresso and toasted tobacco notes. The smoke is very rich and creamy while the ash builds up solidly at the foot, in nice dark grey rings. A true Partagas cigar, with a rich retrohale and a creamy profile. The flavors are still very well balanced in the second third, showing the great construction of the Maduro No.1, there is now the addition of toasted almonds. The body remains at the same level, the overall feel is still very smooth and creamy but the power ramps up towards the final third. The burn is still great, no need to touch up at all. The cigar is getting stronger at this point, it is now at a medium-full level, however the flavors remain still very balanced without any harshness or any bitterness. Some licorice flavors join the fray, as well as some more sweetness. Very enjoyable final third, with still some spiciness and black coffee. In summary: a great after dinner smoke from Partagas, that should get even richer over the years.